I know we have been on as of late with all the Don Pepin/My Father cigars, but there is just one more I needed to get off my plate. 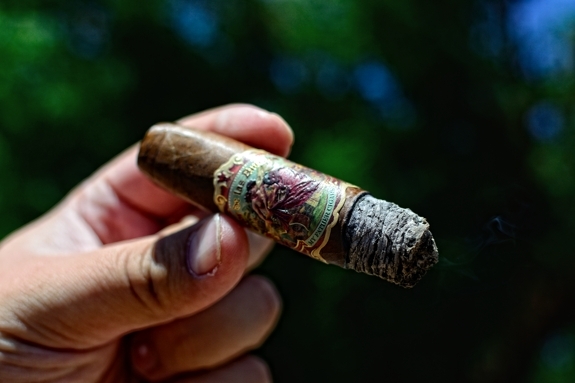 This week’s review is My Father’s newest release, the Flor de las Antillas. 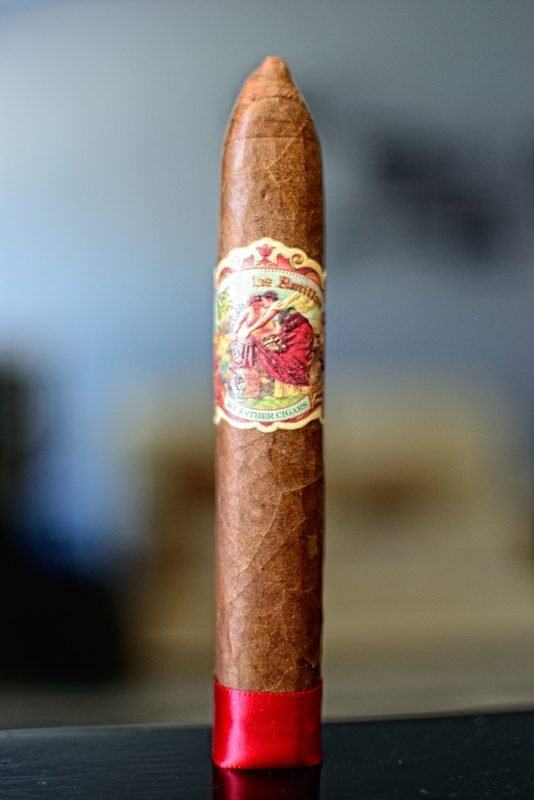 The Good Stuff: My Father’s Flor de las Antillas is the Cuba-born Pepin families’ tribute blend to Cuba. As stated by vice president of sales Jose Ortega: “The name was chosen to honor Cuba, which has always been referred to as the flower of the Antilles”. The cigar is a Nicaraguan puro, composed of various Sun Grown, Cuban seen tobacco and hand rolled at the My Father Cigars S.A. factory in Esteli, Nicaragua. This blend was not only created in order to celebrate their Cuban heritage, but also to complete the My Father portfolio with a more subtle, mid-range cigar. That’s right, this won’t be the everyday powerhouse we have came to expect from the Pepin Family. The cigar comes n four box-pressed sizes: Robusto (5 x 50), Belicoso (5 1/2 x 52), Toro (6 x 52) and Toro Gordo (6 1/2 by 56). They will be packaged in boxes of 20 and retail for between $6.60 and $8.70 a stick. These are starting to hit shops already, I got mine from the amazing people over at Bonita Smoke Shop! 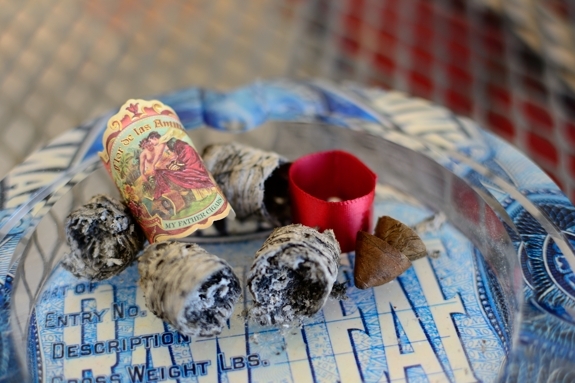 Prelight: The My Father Flor de las Antillas starts off with a beautifully consistent, dark, milky brown wrapper. The wrapper is extremely thick, and smooth to the touch while the shine boasts of the oils the wrapper contains. There are only a few minor veins running through the box-pressed body up to the triple, torpedo style cap. One that I have always loved about My Father Cigars is the elegant designs they choose for their bands and the Flor de las Antillas is a perfect example of that. The band is manila in color with a huge painting style crest of two women in a garden surrounded by roses and a pink, maroon, and gold embossed crest. The top of the crest has the cigar’s name “Flor de las Antillas” while the bottom of the crest modestly states “My Father Cigars”. The back of the band also has “Sun Grown” printed in black ink. 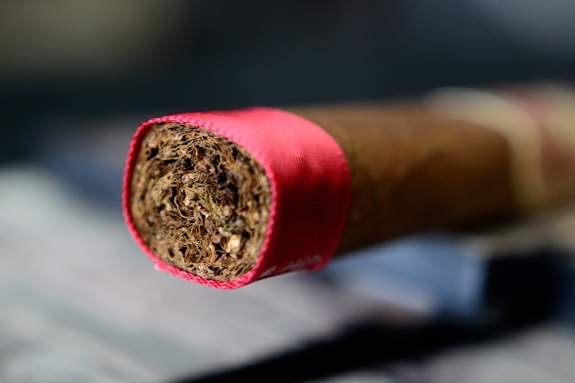 To top it off, there is a nice maroon ribbon style foot band on this cigar that really pull sit all together. Outside if the design, the construction is just spot on with no signs of flaws or soft spots at all. 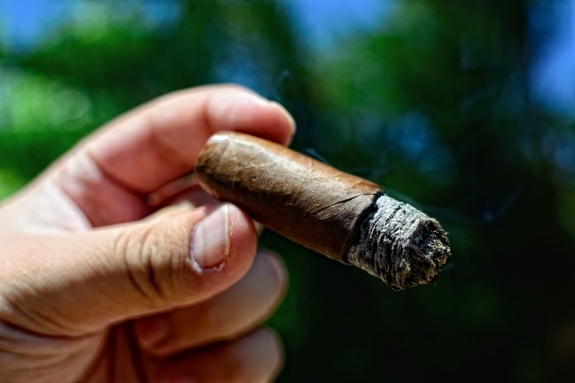 The wrapper of the cigar gives off a very modest sweet tobacco aroma while the foot only carries this strong leathery scent with hints of black pepper. The cap cut very easily using my Palio Double bladed cutter. Usually I have a bit of trouble with torpedos, but this one clipped right off. The cold draw produces are really tart, sweet, earthy and leathery flavor. First Smoke: The draw on this Flor de las Antillas is just spectacular. Every little puff produces a massive cloud of thick white smoke. The flavor profile started out with just a touch of pepper which, given the maker surprised me. Usually I brace myself for strong peppery starts to all my Pepin cigars. The most dominant flavor in the mash-up is some very sweet tobacco along with some bittersweet chocolate mixed in with some leather, spice, honey, earth tones, and this nice mild tartness. The Flor de las Antillas gives off a whole ton of very spicy/sweet smelling stationary smoke. The burnline is razor sharp and dead even leaving behind a thick, compacted white and dark grey ash that held on for a little over an inch before giving way. Halfway There: Into the second third of this My Father Flor de las Antillas and the flavor profile has remained very similar to the first with the exception of a ramp up in the tart flavors, and the absence of the slight pepper I picked up at the beginning. The cigar is going down very smooth. The retrohale is great and just as smooth coating my nasal passage with some very strong wet-wood and spice aromas. The burnline is still dead even with no touch ups or relights. I am only feeling a very slight bit of nicotine at this point. 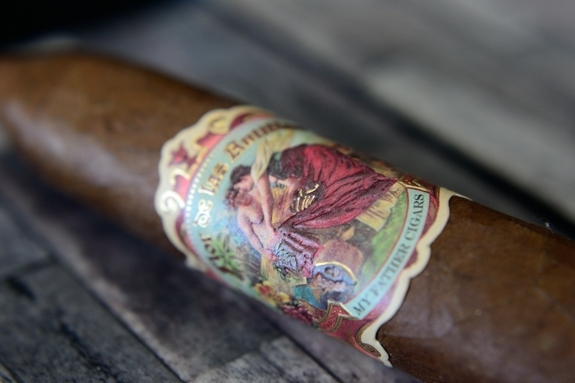 Finish: Again, the final third of the Flor de las Antillas is almost identical to the second third. The only difference this time is the bittersweet chocolate is shining through a little more than it did in the first and second third. The flavor profile is still tart, sweet tobacco, chocolate, leather, and a bit of honey. It’s a great profile, but I wish the cigar had a bit more to it. This cigar finished seriously smooth, just as smooth as the first third with no harshness and only a slight bit of nicotine even down to the final inch. 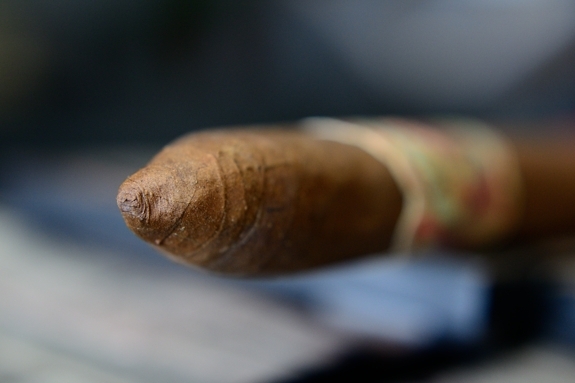 The cigar took a little over an hour to smoke and required absolutely no touch ups or relights the entire time. 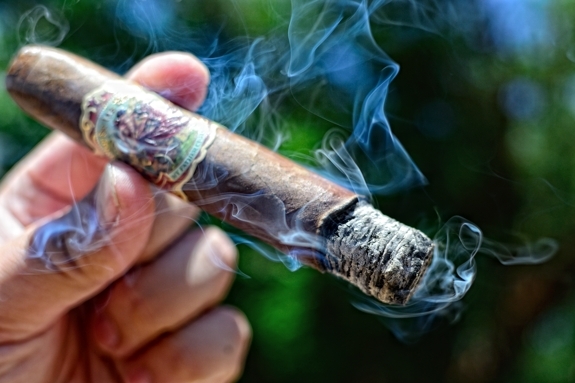 Overview: While I enjoyed My Father’s Flor de las Antillas, it left me craving for more. The cigar is rock solid in everything from the construction to the flavors, but it does lack in complexity. The start of the cigar was almost identical to the finish, while some people enjoy the consistency I really enjoy cigars that change-up and keep my on my toes. I really do think this is a good cigar and I think the Pepin’s hit the nail on the head when they added it to their portfolio. As stated, Flor de las Antillas was added to their portfolio to satisfy the smoker looking for a mid-range, consistent, premium cigar. And the cigar fits the bill to a tee. Although this isn’t a cigar I will smoke too often, I will be picking a few more up for the times when I crave a great, milder experience. 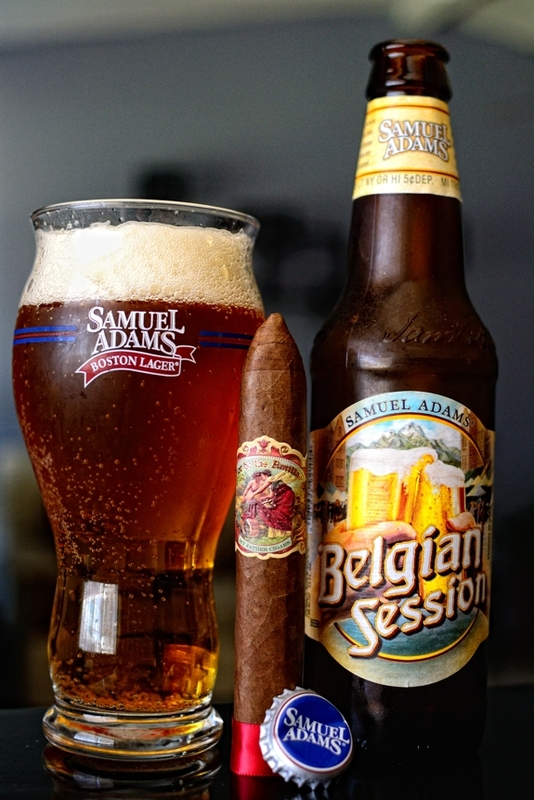 Pairing: Switching it up a bit, I decided to par this My Father Flor de las Antillas with a Belgian-style, domestically created brew, Samuel Adam’s Belgian Session. Brewed by the Boston Beer Company in Massachusetts, this 4.25% ABV Belgian Pale Ale is the epitome of a perfect summer beer. With it’s light orange color, the Belgian Session boasts of caramel, honey, tart, citrus and malty flavors all with a sweet aftertaste. I have to say, being a Belgian beer fanatic, the only thing that Sam Adams misses the mark on is the aftertaste. Most Belgian beers have a very strong, bitter sweet aftertaste while this one is just slightly tart with an almost pilsner after taste. The beer not only paired perfectly with the hot weather we have here in El Paso, but the beer really helped the cigar along as well. The hops and wheat added a little bit of dimension the cigar really needed. The Flor de las Antillas would also pair great with a tripel, or some nice, dark, sweet tea. Looking forward to trying this one. Even if it’s missing that Pepin pepper. Thanks for the read Troy. It’s a really good stick, just totally not what I was expecting. Very much worth a try and honestly, I think this cigar will be a big success. I was finally able to receive your review, I guess whatever you tried worked. Glad to be able to receive your reviews again and looking forward to what comes next. Yeah it got all screwed up for a while. We had no idea for along time either. Glad you are receiving them now! Yeah this cigar is on point. I’m just a fan of the stronger, bolder stuff. Even then I enjoyed this stick. Thanks again for the fix, Tony. I, for one, know how frustrating it must have been for you. Sounds like a nice addition to their line-up. I don’t always want a lot of pepper and power. Sounds like a good smooth smoke Tony. Is this Pepins most affordable cigar on the market? I love the Cuban Classic and recently tried a My Father and it was fantastic. I look forward to trying the Flor de las Antillas. Eh Tony, are you really a Devils fan or do you just like the jersey? They are going to be in tough against the Rangers. Actually I think the La Reloba lines run about $5. They also have the Tacabos Baez which are even cheaper. All good sticks too! Sounds like my type of cigar, and it’s a Pepin, hope to smoke one, good review as always. Thanks man! It really was a solid cigar and I really think it’s going to appeal to a whole mess of people! Could you e-mail me or respond to my DM I sent on twitter a month ago concerning the contest I won and never received anything. You asked me to keep you informed. It would be nice to know one way or the other. Thanx. I haven’t received a Dm or an email from ya man 🙁 I would have gotten right on it. You won the Emilio package right? Let me get with Gary and get back with you. He was shipping direct. You can email me directly at [email protected] I’ll even give ya my personal number if you’d like it. Thanx for responding so quickly. I have been working off my new kindle fire and sometimes things don’t go through. That’s why unfortunately I decided to use this forum to contact you. Yes it was the Emilio package. Thanx. No worries man I always try to keep up with things 😉 I really apologize about the wait. I’ve emailed Gary and the second I hear back from him I’ll get back with you. Thanks forthr patience and sorry again! Pepper or no Pepper I’m a big fan of pretty much all Pepin’s sticks. Sounds like this one is a nice mix up to the typical pepin lines so I definitely gotta get my hands on this one. Nicely done bud! I’m kinda surprised he went with the foot ribbon, seems like signature Fuente or PDR, not very typical of Pepin. Had one of these last night. Great smoke! I’ll be putting a few more in the humidor.